Now that the focus is back to Albany, how about this great photo from the Sandy Brenner collection? 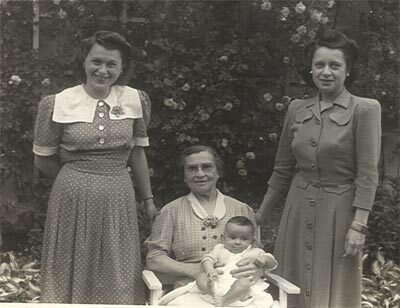 Here we have a photo from 1941 with matriarch Rose Ratner (seated), her daughter Selma (right), Selma's daughter Joan (left), and Joan's daughter Wendy (on Rose's lap). Comments poured in from around the cousin-osphere. Such wonderful news!!! Bob, I know you rallied the night I saw you last month in the hospital, but with Jane by your side, and that old twinkle in your eye, I had this strong feeling you would pull through. It is wonderful to see Walter's photos of you guys actually out for dinner. I did raise a glass for you, and now that I am home, will be talking to Danny about when / how to see you next. I'm envisioning you, Jane, Dan leading us all in a long night of R&R.....I am just so happy for you. Pure Joy to hear the news. Congratulations!!! Now this is the kind of news that makes one smile. Fantastic news Rob. All the Klein's have been thinking of you. Go Rob, indeed!!! I spoke to them earlier and was so happy to hear the news! I knew you would be thrilled too! Let's hope things keep going in this direction and we can both take a deep breath and relax about his health a little! Have a good weekend and send everyone my love. Wow, such wonderful news! When I spoke to him by phone during your visit yesterday, I was struck that he seemed pretty much his old self, funny and sheepish, though obviously weaker. I raise my glass to the power of cousin love: l'chaim, it's better than the alternative. Read more about Good News for Robert!